Home » 2017 was a PAW-SOME year for the cats! When I reflect on the year behind us, I continue to be overwhelmed and amazed by what is accomplished with a humble budget and small group of people – including YOU! Our animals are the luckiest in the world! 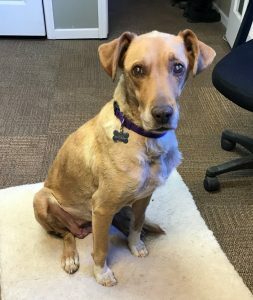 We never stop making improvements for the animals we’ve rescued, and at the same time continue to open our hearts to those in need. 6 tigers, 2 bobcats and 4 hybrids and one rescue dog were welcomed at the Sanctuary. Habitats were renovated for tigers Jeremy & Simon, Zeus and Sabrina including new trees, hammocks, and multi-tiered platforms. Jeremy and Simon received a new cave made from boulders. Zeus received a lower pool so it’s easier to walk into. Lioness Shanti Deva received a renovated cave, a new platform and perch system and a new jumbo-sized hammock for her indoor room. 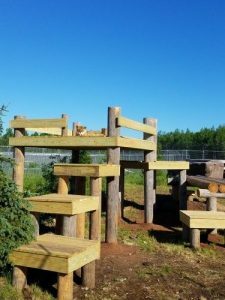 The ‘4 Wild’ cougars Aspen, Blaze, Snow and Storm received a HUGE new roofed habitat complete with several platforms, trees, cave, den boxes and four indoor-temperature controlled rooms. The ‘5 Wild’ cougars Noah, Carlo, Andre, Donoma and Langley’s indoor rooms were renovated. 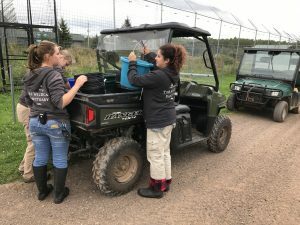 The three bobcats, Tractor, Athena and Libby, moved into their new free-roaming habitat in the Feline Meadows section of the sanctuary with access to a temperature-controlled room. Skywalk systems were installed for bobcats Henry, Haley, leopards Shadow and Shazam, and hybrids Maximillion, Leo, Diego, Ella and Indie. This provides them all much more vertical use of their habitats. Hybrid Haven was reconfigured and new habitats completed to accommodate cats that want to live alone. A new large bungalow was constructed with three yards for Leo, Abby and Maximillion. This freed up another bungalow for savannah cat Kona. Bobcats Belvedere, Francis and Autumn graduated to a larger habitat in Wildcat Pines. This freed up a bungalow and yard for bengal cat Adrian. Lynx Lindsey received a new cave for shade, one of her most favorite places to lounge. 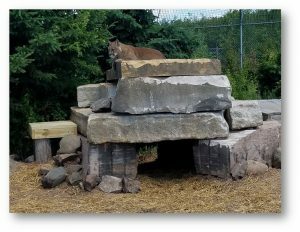 Cougars Raja and Liberty received a refurbished cave made of boulders to replicate their old concrete cave for ease of use for Liberty. Two new heated bungalow buildings were provided for bobcats Scooter and Baby Jenga in Wildcat Pines. The buildings will be repurposed for other cats once the Wildcat Pines Renovation is complete in 2018. Plans for renovation of the Wildcat Pines were completed, materials were purchased. The new design includes roofed habitats for 23 bobcats and one lynx with more vertical space. They’ll all have access to a permanent, indoor temperature-controlled animal building. Excavation was started for a new lion area. This multi-acre area will be able accommodate two prides of lions and include a building allowing cohabitation and lounging for a pride, outdoor covered areas within the habitat and acres to explore. It’s our biggest habitat area yet! Hospital upgrades continued including purchasing a new digital x-ray machine, CBC blood machine and adding a Hospital Manager position. Indoor quarantine enclosures were upgraded to allow for more vertical space to accommodate larger cats. We installed permanent walls to aid in sanitation and drainage. 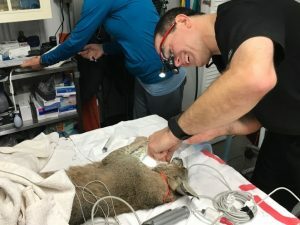 Life-saving diagnostics and surgery were performed on leopard Shadow, tigers Daisy and Pandora, and rescue dog Cookie and needed dental work on bobcat Luna. Two new utility vehicles were purchased to aid in daily feeding of animals and construction. In addition, a new rescue van was purchased for reliability on cross-country rescues. An automatic generator and additional tiger transport crates were purchased as part of our safety protocol. A new septic tank system was installed for the entire sanctuary. 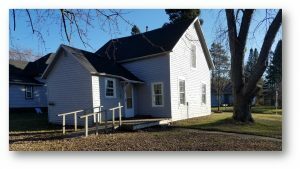 A new intern house was purchased to accommodate up to 8 interns at a time. 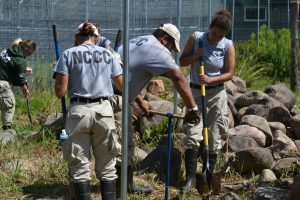 Growing the program benefits the animals at the sanctuary and helps us inspire future animal advocates. Zone responsibilities were implemented to provide more customized care to residents. This supports our new strategic anchors that help guide our work. 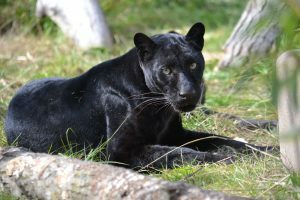 The Wildcat Sanctuary joined the Big Cat Sanctuary Alliance and was the host sanctuary for the Big Cat Sanctuary conference where over 40 leaders from the industry came together to share ideas and best practices. Director Tammy Thies sat on the Big Cat Rescue and Big Cat Events committee and presented Crisis Communications Protocol at the Big Cat Sanctuary Conference. Tammy Thies, our Director testified and was expert witness in multiple cases to ensure wild cats did not end up in private hands and that licenses would not be re-issued to repeat offenders or those with ongoing violations. The Wildcat Sanctuary reached 2.9 million people through Facebook. Fans have become advocates and support legislation, write letters and help educate about the captive wildlife crisis. On-site volunteer support was provided by over 30 Volunteer Crew Days, 6 weeks of full-time AmeriCorps volunteers and gardens were beautified by TWS volunteers. Wow!!! That is amazing! We could not do this without all of YOU!